The Patriarchate of Antioch and All the East has brought online a special website dedicated to the enthronement of His Beatitude Patriarch John X, which took place this Sunday, February 10. The site is available in English, Spanish and Arabic. Visit the website here. We thank the Lord our God who allowed us, in the two previous months, to celebrate His appearance in the flesh as man and His manifestation as God coming to save us. After Jesus has fulfilled His plan of salvation by dying on the cross and rising from the dead, and after He ascended in the flesh to heaven from whence He had descended, sitting on the right hand of the Father, He prayed the Father to send the Holy Spirit to dwell in the hearts of each of us. Everyone who desires this and wants the Spirit to dwell in him does this so that Jesus may appear to him, and also that he might be reminded of the Lord’s sayings and teachings. The Holy Spirit shows us Jesus Christ, at first in the Church, which is His Body and which He wanted to be “a glorious church, with neither stains, wrinkles, nor any such thing” (Eph. 5: 27). It also makes Him present in the Church through the word of His Gospel, in the Body and Blood of His Eucharist, in His meeting with His brothers who gathered in His Name, as well as in every human being - especially in the poor, the homeless and the broken hearted, in whom He accepted to dwell. The Holy Spirit reveals Jesus wherever it dawns, making Him present yet veiled in all religions and all cultures. Jesus, Emmanuel, is always present here and everywhere, present among us. He is always with us, ready to meet us. He rejoices in our joys, He revels in our holiness, and He weeps with us when we are troubled and sorrowed. He also cries when, as shepherds and flock, we neglect to live according to His teachings, and whenever our sins mar His bleeding, yet glorious face, and thus veil the world from seeing Him in His Church, and through us. Brethren, let us on this blessed day, when the cross of shepherding the great and glorious Church of Antioch is entrusted to me, join hands that together we may live its glory and reveal it to all. This happens when we listen together to Jesus, and when we pray daily: “teach me to do thy will, for thou art my God” (Psalm 142: 10). God is not pleased to see that the unity He wants for His people is shattered, and that His flock is divided into many factions. We, together, constitute the people of God, a charismatic people, a holy nation, a royal priesthood. Each of us must realize the gifts given to him by the Spirit in the service of others. The shepherd is the first servant who sacrifices himself for his flock; he knows each of them by name, like the Good Shepherd who gave his life for all. The shepherd does not command “as if he was an autocrat” (Ignatius of Antioch: Letter to the Ephesians 3:1), as the great St. Ignatius of Antioch wrote in his letter to the people of Ephesus. The shepherd orders by love and sacrifice. He orders by the cross which he willingly climbs, as his Lord did before. He observes the talents of his flock. He recognizes the good in them to enhance it. He calls us all to participate in the Kingdom’s Design that starts here on this earth, in the Church. And then the flock should put all their resources and their powers at the service of the Church, our true mother. In this way the face of Christ will be revealed under the leadership of the bishop who steadfastly calls for love, service and “cooperation”, “For one is your Master and all ye are brethren” (Mt. 23: 8). Let us practice this brotherhood in mutual respect and rise above ourselves, as our Lord has done by loving us unto death. God is not pleased to see His Church which is called upon to care for all —not caring enough about the poor, those little ones whom He loved, and not treating them as its priority and the priority of its institutions. Jesus desires that no one should suffer from poverty, especially when He knows that we ourselves have the necessary means and resources. Why don’t we set as our goal what St. John Chrysostom, the great shepherd from Antioch, taught us: “Do not possess anything that you have. What you have belongs to the others. It is yours and your neighbour’s as well, like the sun, the air and the earth” (Homily n. 20 on the Epistle to the Corinthians). Jesus suffers when He sees many of us, and especially the young, drift away, leave the flock or become indifferent. Regaining them must be our utmost priority. Thus, we will rejoice at the return of the prodigal son and that he may resume his place in the work of the Church. Why don’t we seriously ponder the real reasons behind the emigration of our young? Why don’t we develop the methods of our pastoral care that we may reach them, not only with words, but through liturgical revival, and through the teaching that refocuses on the core of our tradition and liberates some of our practices from monotony? We have to find a way that enables them to touch the depths of our inspirational Liturgy, to let them inhale from it, and show them that it will open many opportunities for them to enter into God’s and their brethren’s hearts. We face the huge task of modernising the practice of our pastoral care and of our educational programs. Such a task requires the participation of the priest, the monk, the nun, and the lay men and women. The task has to be founded on the knowledge of the theologian, the specialization of the educator, and on the labor of workers in the pastoral field as well. Indeed, our youth are the treasure of our Church. They are its ambassadors in this rapidly changing world. We want them to assume the role of ambassadors in a serious way. We want them to know that the whole Church needs their enthusiasm and commitment. It needs their readiness to consecrate their lives for a goal they want to achieve. We have to make them aware of their special role in the Church of Christ “who loved the rich young man” and was saddened by his departure. The young are rich in their modern outlook, in their passion, and in the many gifts that God bestowed upon them. We need them and urge them, through our love, to always work in the Church’s workshop and to consider themselves responsible for it along with their brothers, and especially those whom God has called upon to watch over His flock. If we love them the way Christ loves them, then our relationship with them would become one of brotherhood, love and mutual respect. In this way they will overcome every contradiction between obedience and authority and will live as the children of one family, obeying those who obey Jesus Christ. Thus, authority becomes obedience and obedience becomes a loving authority. God is not pleased when He sees us clinging to the letter of things, emptying the letter from spirit and life. We know that the Church is alive by the Holy Spirit, and through ‘Which’, it has survived throughout history. Ecclesial Tradition is not something motionless or stagnant but a tool of salvation and a way to understand the divine sacrament. We live at a time where tradition is often rejected, and this negatively affects our youth. Our Church is concerned with the developments of our time because Jesus Christ wants it to be His witness at all times. Following up on a time like ours requires wiping off the dust that, due to our sins, has accumulated on our tradition throughout the centuries. It also requires working to reveal what is authentic in it. Modernity is a blessing that calls us to revive the fundamentals of our worship and teachings, and also to differentiate between the one Holy Tradition and the many secondary traditions and practices to which we often cling. The witness of the Church, at this age, is to discern and make choices. Modernity offers many opportunities. We must resort to the good in it to regain our people who are getting increasingly attracted by prevailing globalization. Our Church must not fear to use the methods available in our time to modernise its practices, to build bridges towards its children, and to learn to speak their language. This is what the holy fathers did when they used Greek philosophy, which was widespread in their time, to convey the message of the Gospel in a language that the people understood. We have to follow their example if we are to remain faithful in transmitting the message. The challenge lies in making the life of Jesus Christ glow in our faces, in our worship, and in all the aspects of our Church that the people may find their salvation in it. Finally, renewal is not only to modernise the texts and to make them understandable in the language of our time, but to renew the human soul and bring it closer to the face of Jesus. All its attention must be in His direction. Only then will modernisation interact with the human heart and lead to the salvation of man. Needless to say, the Lord is saddened by the violence and killing now permeating many regions, as is now happening in Syria. We have there members of our Church who have been forced to leave their homes and towns; they have become jobless, they have lost their means of livelihood. Love is the enemy of death and of violence wherever they may come from. We have to consider the cause of the homeless as our cause and help those who suffer from this tragic situation. We have to show them our love, to consecrate ourselves to comfort them. Jesus suffers in each one of them; do we see Him in them? Shouldn’t we consecrate ourselves to serve them by donating a part of what we own to them? Shouldn’t we be ‘the administrators of divine matters’, as the great Antiochian St. Maximos the Confessor said? In this respect, we have to carry the cross of our country and to pray and work for reconciliation, brotherhood, peace, freedom and justice in our region, categorically refusing all kinds of violence and hatred. Jesus is undoubtedly saddened when He sees some of us, shepherds and flock, behaving in a way totally strange to the spirit of His Gospel. Such behavior transforms our character and becomes a stumbling block in guiding people to imitate Jesus and espouse His ethos. Hence, we have no choice but to repent as persons and as a community, and to rely fully on God, seeking His forgiveness, and trusting that He will guide us to His path. “He who longs after God and finds his ease and comfort in Him, God can be seen in him for God is in all His creatures”, according to St. John of Damascus. Here we appreciate the importance of a good clerical education that will provide us with shepherds who will live and behave according to God’s will, who will be committed to the mission of Priesthood and who will participate in the Church’s work. Therefore, I call our youth to approach this ecclesiastical service with humility, steadfastness and boundless love for God, remembering the Lord’s saying to Peter: “If you love me, feed my sheep” (John 21: 15). To help those priests in fulfilling their mission and succeeding in it, we ought to support them and assure them a decent life. The community has a major role to play in this regard. The monastic movement plays a central role in the revival of the Church and in its spiritual life. We are thankful that in the past fifty years and with the help of God, we have regained in our Patriarchate, these “spiritual oases”, the monastic orders that arose in the first centuries of Christianity. We need monasteries with members who truly live brotherly communion in prayer, spiritual exercise and physical work, thus carrying us with them in their prayers. We are certain that their fervent prayers will protect the entire world and will strengthen the Church in fulfilling its mission. Jesus wants everything among us to be performed decently, wisely, in an orderly manner and abiding by the rules. We respect our institutions and our laws, and we try to remove the obstacles that stand in the way of their proper implementation. Canons are not rigid laws. They are an expression of the life of the Church and of its relationship with its Lord. In addition, we should enable the institutions established by our ancestors, with the grace of God, to be more conscious of the challenges of the modern consumer society. These institutions should continue to inhale from our tradition and from the Spirit manifested in it. If we do that, then the dialogue with the world will become easier and our children will be better equipped to face the challenges of modernity. They will also get acquainted, without fear, with its positive aspects. The only reason for justifying the existence of an institution in the Church is to witness to Jesus and to spread His teachings in its own way, although it may have other important social and cultural roles to play as well. Jesus wants his Church to be the light of the world, and the light should not be hidden. It should illuminate the minds and hearts of our people. We have to mobilize all our resources and activate all our brethren to serve their mother, our Antiochian church, that it may preserve its shining light ignited in the past by our Apostolic See. In this respect, we recall the important role of St. John of Damascus Institute of Theology and of the University of our Orthodox Church, the University of Balamand, in renewing the pastoral vision, in offering new possibilities, and in helping to find the right responses to the urgent challenges facing our generation, as well as our institutions. We please the Lord when we work as shepherds and flock in strengthening the unity of the Orthodox churches, in helping them in the realisation of the awaited Great Holy Synod, and in resolving the challenges facing it. We cannot, in this respect, forget the basic role of the Church of Constantinople and the Ecumenical Patriarchate. As for us, in Antioch, we shall remain a bridge of communication among all, and supporters of all decisions taken by consensus of all the churches working together. We are also committed to finding solutions that will manifest the face of Jesus in His Church, for the salvation of the world, setting aside all divisive material and mundane concerns. Jesus cries when He witnesses the divisions in the Christian world, and the distance among its members, as well as the recent weakening of ecumenical work. We have to pray with Jesus and all brothers belonging to Him, that “the unity Christ wills might grow” (John 17: 1). We must understand that this unity is a necessary condition “that the world may believe” (John 17: 21). The drifting of the people away from faith, their disinterest in God’s love, their reliance on a world without the God who created them in His own image, calling them to His likeness, and offering them a way toward deification, is disturbing. These tendencies urge us to try and instill harmony between the Eastern and Western churches and to strengthen cooperation in the fields of ministry and pastoral care. We need to encourage dialogue, to get to know each other better, and to take daring religious initiatives so that we may reach, in God’s good time, the communion in the one chalice. We may then tell those who ask about our faith: “come and see” (John 1: 46), come and see how our love for each other stems from our love for the One who loved us and gave His life for all. God is not pleased to see co-existence with non-Christians with whom we share the same country regress and even vanish here and there for various reasons, for reasons of politics, or for fundamentalist tendencies, that have nothing to do with religion. Love does not know fear or hostility: “Love is patient, love is kind. It does not envy, it does not boast… It keeps no record of wrongs. Love does not delight in evil…” (1 Co 13: 4-8). Love is our byword and our weapon. We, the Antiochians, are an Eastern church; its roots go deep in the history of our region. Along with our Muslim brothers, we are the sons and daughters of this good earth. God wanted us in it to witness to His Holy Name, and in it we must stay, encouraging decent and respectful co-existence, refusing all kinds of hatred, fear and arrogance. To my Muslim brothers I proclaim, we are not only partners in the land and in its destiny, for together we have built the civilization of this land and shared in the making of its culture and history. Let us therefore work together in preserving this precious heritage. We are also partners in worshipping the one God, the true God, the light of the heavens and of the earth. We are a church and not just one confession among others. The Church includes the confession and does not deny it, but the Church is not a confession whose concerns stop at its boundaries without thinking of the others. This is so because our Lord asked us to love everyone and to seek the common good. This does not mean that we should neglect the concerns of the community that constitutes the social environment of our church. We have to care, according to an open evangelical spirit, about all its components. We continuously pray for all its members because this is how we “lead them to God” (St. Ignatius of Antioch). We want to listen to them and try to solve their problems and difficulties. We know that many of their members emigrate because they are afraid and anxious about their fate; they emigrate searching for a better life. The Church must deal seriously with these problems which are at the heart of its mission, using all available capacities, resources and endowments to help its children stay in this region. As for those who have already emigrated or are about to emigrate, the Church must find adequate ways to shepherd them abroad, in their respective Antiochian archdioceses. We must always call them to be “imitators of Christ even as He is of his Father” (St. Ignatius of Antioch: The Letter to the Philadelphians 7: 2), reminding them that they are all “fellow-travelers and God-bearers” (St. Ignatius of Antioch: The Letter to the Ephesians 9: 2). Without God and without returning to Him in total humility, all human associations are in vain, with no present and no future. My brothers, my sons, our common concern is to please God. 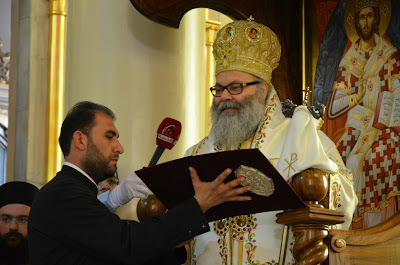 This is the main challenge that members of the Holy Antiochian Synod, and our archdioceses in the homeland and abroad, our sons and daughters, and all members of our Church will have to face. The Antiochian See is one and we will continue to work that it may remain united and continue to shine even brighter. Our archdioceses are and should be open to each other and should cooperate at all levels. They should be open to the other Orthodox churches, to the sister Christian churches, and to all people of good will. The goal of our Antiochian Patriarchate is to ensure that Christ is not ashamed of us. Rather, we have to stand united together in love in order to fulfill this goal. Help me to reach this goal, that our church may shine by His light and may serve as a vehicle of peace, brotherhood and cooperation. It is this goal that will ultimately salvage our deteriorating world and infuse it with meaning. We know well that this meaning is in us, but it is often hidden behind our passions and sins. I humbly and collegially call upon all our archdioceses to actively congregate and wipe off the dust of the precious jewel entrusted to them. Through joint solidarity and participation of all members of these archdioceses, we shall together bear witness to the One God who redeemed us with His precious blood, and who wants the Antiochian Church, where we were first called Christians, to recover the leading role it played in its glorious history.